Ghost have surprise-released a digital version of their new live album, “Ceremony And Devotion”, and are streaming a performance of “Absolution” ahead of the project being issued on 2CD, 2LP and 8-track on January 19. The song was originally featured on the band’s third record, 2015’s “Meliora”, which delivered Ghost their first-ever US Top 10 when the project debuted on the Billboard 200 at No. 8 and went on to win the group their first Grammy Award in the Best Metal performance category for the set’s lead single, “Cirice”, and a Swedish Grammis Award for the "Best Hard Rock/Metal Album" of the year category. Recorded during Ghost’s 2017 world tour, "Ceremony And Devotion" was produced and mixed by Tom Dalgety and features fan favorites spanning the band's entire catalog – from 2010’s "Opus Eponymous", 2013’s "Infestissumam", 2015’s "Meliora" and 2016’s "Popestar" EP. 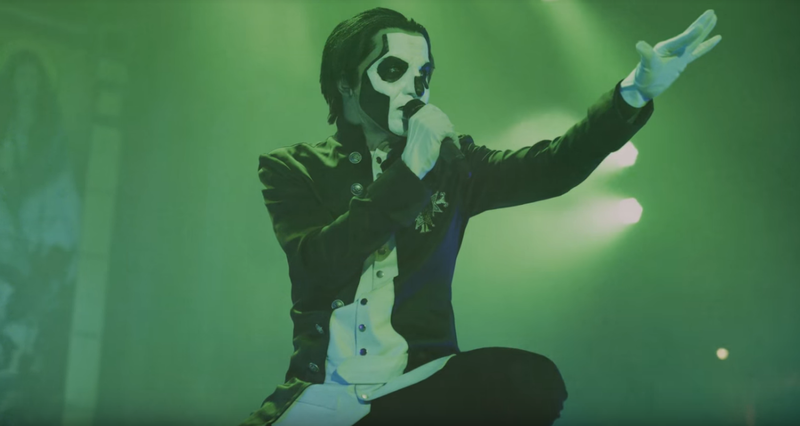 Ghost revealed their new frontman, Papa Emeritis Zero, in a dramatic fashion at the finale of their September 30 concert in Gothenburg, Sweden; he replaces outgoing frontman Papa Emeritus III as the band prepares for album number four. “We've been in the studio for about a month now," singer Tobias Forge (aka Papa) explained recently, "and by the end of the year, if everything goes according to plan – knock, knock – we're gonna have a new album, not out, but we're gonna have a new recorded and mixed and delivered. And hopefully that means that we're gonna have a new album out by April – possibly, hopefully."